A recent column from Boston.com claims that the Mets remain the team most interested in Orlando Hudson, but only if “they are able move Luis Castillo”. Granted, that tidbit may not be worth a hill of beans (heh heh), since it comes from Boston — and what do they know about the goings-on in Flushing? But we have heard that Omar Minaya spent a good chunk of time during the winter meetings trying to trade Castillo, and in fact moving the second baseman appears to be a priority. However, there are at least 10 more important things to do before the Mets need to worry about their 2009 MVP. As Casey Stengel explained, “You have to have a catcher because if you don’t you’re likely to have a lot of passed balls”. If Bengie Molina really wants more than a year guaranteed then it’s back to the drawing board. Is Hobie Landrith available? 2. Get a left fielder — preferably with some power. The ship for Jason Bay has not just sailed — it has sunk. The longer he waits the more we realize he’s not a good idea. But the Mets still need a bat to put in left. 3. Locate a setup man. There are still a few bargains left on the free agent market. Do not assume that the Jorge Julio of Japan or an older version of Duaner Sanchez is going to cut the mustard. Scott Eyre, Joe Beimel, Neal Cotts, and several others are all out there, waiting for an offer. He’s throwing for scouts next week. If his arm doesn’t fall off, sign him. He’s less of a gamble than Oliver Perez, with way more upside. 6. Get an innings-eating starter. There are a few available via free agency and through a salary dump deal. Stop fooling yourself into believing that Perez and John Maine will one day be 200-inning starters. 7. Pick up a righthanded-hitting first baseman with some pop. It’s fine if you want to give Daniel Murphy a shot to be the starter. But it won’t hurt to have a RH-hitting slugger off the bench — or to take over in case Murph follows in the footsteps of Jason Phillips. 8. Hire a mental coach. Mike Pelfrey, Oliver Perez, Angel Pagan, and John Maine are just a few of the players who might benefit from some mental gymnastics training. This guy seems pretty good. 9. Bring in an outfield coach. Hire Ron Swoboda to work with Angel Pagan during spring training. Who knows maybe he can teach him some baserunning as well. 10. Hire an assistant to Dan Warthen. You had your chance to fire the bus driver but since he’s still around the least you can do is provide him some help to address the staff that walked more batters than every MLB team other than the Nationals. Brad Radke, Bob Tewksbury, and Fritz Peterson are three of the greatest living control pitchers of all time, and none have a job in baseball right now. Once the above ten actions are accomplished, THEN moving Luis Castillo may have an impact on the Mets’ 2010 fortunes. REALLY is a Plan in place. Tell Bay to go to Beirut and let’s move on if WE take the offer off the table let’s see if Bay blinks if not F**K him. None of the guys still available are any better than what the Mets already have in the pen. I’m happy with what the Mets have in the pen – its not really an issue. Trading Castillo has to be a high priority for one reason – his horrid defense. The Mets have the makings for a good defensive club (depending on what happens at C and LF), but having the WORST defensive 2B in all of baseball (check Fangraphs, he really was) ruins that. I think a great deal of Pelfrey’s problems last season were due to Luis’ continued decline defensively and the loss of Reyes defensively. The best thing the Mets can do is build a strong defensive ballclub. And that starts with getting rid of Castillo. Mets need to pitch. Outside of Feliciano the pen was not good last year. Why do we hear about the vastness of Citifield when in comes to Mets offense but why hasnt the pitching staff had this amazing year? Mets need two starters and at least two relievers. Maine Pelfrey and Perez should compete for the remaining two rotation spots. None of them have proven to be more than back of rotation guys. The offense should be addressed with guys that are looking for starting roles at the end of the off season. Money need to go to Pitching and Bay offer should be pulled quick. i disagree.. getting rid of castillo should be 1 thru 9.. than do one from the list.. I say sign Sheets to a 1 year contract with an option for year 2 I’m guessing 1 year 6 million. 2nd year at 10 million. sign Ankiel for LF and offer Bedard a 1yr deal with lots of incetives. Mets offseason moves should be…. Trade for Arroyo 12 mil. Sign Sheets 1 year 8 mil incentive laden deal to reach 12 mil. Sign Wang to 2-3 mil deal with incentives and let him rehab in the minors. Wang and Sheets are 2 guys who are perfect to take a 1 year shot on. These guys are top notch pitchers who more than likely will find it again. And they dont require 2-3 year contracts. Sign Beimel to 1 year deal 2 mil. Sign Delgado to 1 year 5 mil incentive laden deal as a stop gap to Ike Davis. Leave Pagan in for his speed and defense. He has a solid bat and he can hold the position for at least a year more for FMart. Trade Castillo and eat 7 mil of his contract and aquire another bullpen arm. Move Murphy to second base. He can’t be much worse than Castillo at this point. We dont need to sign Bay or Holliday. We would be investing too much money into players who dont fit he mold of the stadium or the team. Citifield is made for pitchers, speed and great defensive players. We already have a defensive reliablity at second in Castillo. No need to add more players who lack defense especially for large contracts. Per your # 1, just because the late great Harry Chiti is long gone from this world doesn’t mean he can’t return to catch for the Mets again! As per Mr IveMetFan’s comments; You need to slow down on the booze. IveMetFan: why does it seem like your plans for the future change on an hourly basis? First you had Murphy going to Toronto, then to Cincinnati, now he’s playing 2B. How about some consistency? You have some good ideas, but I think you’re better off investing your time in evaluating the moves the Mets make in real life and then suggesting the alternatives, rather than spewing a bunch of “must-sign” free agents with unfounded dollar amounts and changes in positions that make little sense. Develop a plan, stick to the plan, and if the Mets deviate from your plan, point out where you think they’re going wrong, or if you think they’re direction was better than your own. Playing fantasy GM just doesn’t do a lot to further the conversation – especially when your plan moves around like a hummingbird in the springtime. And to anybody who thinks trading Luis Castillo and then signing Orlando Hudson is going to solve all our problems needs to get a clue. Castillo had an offensive renaissance last year while staying healthy and committed, which is more than 90% of his teammates and coaches can say. To me, that’s the type of player I’m looking to retain, not trade in exchange for a hill of beans. And why does everyone seem to forget that Orlando Hudson lost his starting job to Ronnie Belliard last year? Is that really the highly saught prize we all desire? Give me a break. Harry Chiti is that the only thing you have to offer in the comments section as stupid non funny non productive comment. Grow up. As for Isuzudude, I deviate from my plan because there are so many options out there to make this club better. If I can think of so many to help the team you would think a MLB GM would be thinking similiarly. I am just throwing some REASONABLE ideas out there. Trading Murphy to Cincinnati is not unreasonable nor was trading him to Toronto with other players for Halladay (If Halladay wanted to come here and the Mets were willing to give him the extension that could have been done). You cant be serious Isuzudude about retaining Castillo? If Omar Minaya could find a suitor for Castillo he would be gone in a heartbeat. Career year? If you call being the poorest defensive secondbaseman in baseball a career year you my friend have alot to learn about baseball. OPS and average means nothing if you can’t steal bases,field or drive in runs. Castillo can’t hit the ball out of the infield. He has just enough speed to beat out infield hits. But have you seen his stolen base numbers? IMO Murphy playing second is an upgrade. It shouldn’t be out of the question if we are not going to deal him. Since we have no defense at second anyways with Castillo might as well put Murphy there. Jason Bay and Holliday should not play in Citifield. Their numbers would definetly go down, do to the pressure of NY (jus ask Beltran how he felt his first year here), playing 81 games in a huge park and when they commit errors on the field because they have to run along way to get to a ball it would definetly hurt them at the plate as well. Putting any of them in Citifield will hurt our defense and hurt our chances of getting other players who can help. Lets not put all of our eggs into one basket. And lets not add another defensive liablity on the field. AGAIN I’LL SAY IT FOR ALL OF YOU NON BASEBALL THINKERS OUT THERE. ITS FARELY SIMPLE. PITCHING WINS GAMES. GREAT PITCHING BEATS GREAT HITTING. AND THE METS NEED PITCHING DEPTH!!! Taking a flyer on good solid pitchers coming off of injuries is not a bad move. Taking a chance on pitchers with great stuff is always a good thing. The rest of the moves should be minor. Pitching, speed and defense. Let me preach that to you the whole offseason. We are not the yankees or phillies. Signing Bay or Holliday would be the equivalent to the Nationals adding Adam Dunn to the team. NO EFFECT. How would you feel if you woke up and heard the news. “Mets sign Sheets, Wang and trade for Arroyo”. You would say that is one hell of an offseason. How would you feel if the news was also. “Mets trade Castillo get another arm for the Pen”. “Mets sign Beimel to 1 year deal”. Adding a desperatly needed lefty to our pen who had good numbers and is only 32. If you heard that news you would be estatic. Wouldn’t you? IveMetFan: I think if YOU heard the news you would be ecstatic. I don’t think I would be anything more than mildly optimistic. Ben Sheets is no lock to even throw 30 innings. Nor is Wang. Arroyo is more of a #3/4 starter than a #2, so his addition (at what cost?) would still mean the Mets have Johan and a bunch of 3’s and 4’s. If Castillo is traded, how much salary do the Mets eat and who is the addition to the pen? Guillermo Mota? Maybe to you Murphy sounds like a great idea for 2B, but to me (and many others) Murphy at 2B spells disaster. And you have not presented enough proof to sway my opinion. So, no, if those moves were made I would not be “ecstatic.” I would be pleased to see the Mets front office isn’t on permanent vacation and is doing something to improve the forecast of 2010, but I wouldn’t be sold that these moves, in particular, are putting the Mets any closer to playoff contention. As for Castillo, perhaps I am in the minority for wanting to keep him over trading him, but some of the knocks on Castillo I’m hearing are unfounded or unfair. For instance, you say, “If you call being the poorest defensive secondbaseman in baseball a career year you my friend have alot to learn about baseball. OPS and average means nothing if you can’t steal bases,field or drive in runs.” Castillo had 20 SBs in 2009, so the notion that he can’t steal is ridiculous. Castillo also bats from the #2 spot in the order and has never been known for his prowess for driving in runs. Are you expecting him to finish the season with 85 RBI? He is a “table-setter,” the type of player who gets on base for the big bats in the 3, 4 and 5 spots to drive him in. He’s also savvy at sacrificing himself to move other runners along, and at making contact so his atbats are rarely wasteful. But I suppose these qualities are easy to overlook if you’re expecting him to be a slugger. That’s just not his game; but that doesn’t mean he’s not valuable. As for his defense, his fldg% last year was .982, which was .002 worse than his career average, so I’m not hammering him for that. As far as UZI’s and range factors go, to me, those stats mean bunk. Why? Because they are subjective, made up by some stathead who is determining which balls Castillo SHOULD have gotten to opposed to the balls he did get to. 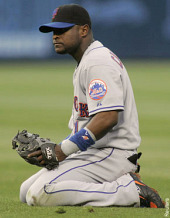 Who is to tell, then, if Castillo has poor range, or if the Mets coahcing staff is just poor at defensive positioning? So I don’t go by those garbage stats. I go by what I see, and, though it’s true Castillo is no gold glover, by my standards he certainly is not a liability on defense like many are leading us to believe. He’s not Chuck Knobluach out there, for goodness sake. And Castillo’s defense is not so horrible to make me want to get rid of him by way of eating his remaining contract and taking some castoff in exchange from another organization.